Recently we have walked along many miles of forest path, waded through floods, climbed slippery slopes, got wet boots, and although we have thoroughly enjoyed ourselves, Cockrobbinn and I decided that today we would do a more civilized route on our Geocaching travels. We drove to Fleet which we know well and parked up a side road as we had spotted a perfect triangle of caches in The Cachers 5K series and it looked to be exactly what we wanted; also if we missed any, we have to make a return journey to Fleet tomorrow (Monday) as we both have dentist appointments booked in the morning so the thought is that we can collect any caches we have missed. Good thinking batman! The Cachers 5K series is a triangular route along Elvetham Road, Reading Road North and Fleet Road; the latter being full of coffee shops which was perfect for a quick refuelling stop as we had only taken a bottle of water with us. 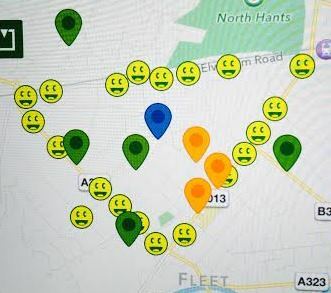 In all we collected 20 smilies; 16 in the series and four others; one DNF which we have reported as missing as we found GZ but having noticed a few caches along the route had been tampered with, we believe this one to have been removed. I really have to say that this route was not my favourite sort of walk as all three roads are quite busy although there are pathways on all three and not a puddle in sight. Some beautiful large houses to be seen along Elvetham Road which we enjoyed looking at but the noise of the road would disturb me I think. Most of the caches were very easy to find and most were between 200m and 400m apart which actually got a bit monotonous (for me) after a while. Cockrobbinn really enjoyed the ease of finding them but I prefer to have a cryptic clue which makes me have to think about where a cache may be hidden. We are all different I suppose. My favourite find of the day was hidden in an old broken railing. Although we knew where it was, it proved extremely difficult to get out with me having to fashion a hook out of a long twig and carefully pull the container out. Cockrobbinn wanted me to leave it more exposed but, apologies to the next Geocacher, I pushed it back to where I found it !! By the end of our circuit we had reached 172 ‘found’ caches although we still feel like relative newcomers and are learning all the time. It is interesting to see what sort of caches withstand the weather (quite a few today were very damp) and which ones are hidden best. Cockrobbinn and I are just starting to think about setting a few caches ourselves, local to where we live as there is quite a large area where there are none. It really is good to get ideas of which caches work well; I’ve already got some very cryptic clues in my head which Cockrobbinn thinks are too difficult, but then our minds work in such totally different ways! I have started a collection of containers at home which we can utilize for caches; most being very watertight and perhaps in the Spring we will decide where to start but the important thing at the moment is looking and learning. Twenty years from now you will be more disappointed by the things that you didn’t do than by the ones you did do. So throw off the bowlines. Sail away from the safe harbor. Catch the trade winds in your sails. Explore. Dream. Discover. This entry was posted in Cache, Caching, Fleet, Geocaching, Hobby and tagged Fleet, Geocaching, route, Smilies. Bookmark the permalink. Hi, We undertook the Fleet 5K in October and viewed it as an ‘ideal’ poor weather circuit. When we did it the bonus cache wasn’t there, and we’ve subsequently lost the bonus numbers! 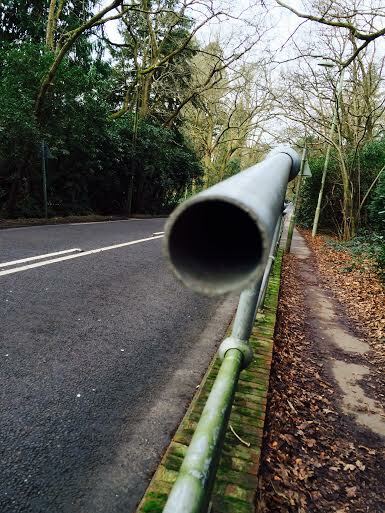 As for great cache containers – have you seen any of JJEFs (North of Bracknell/Maidenhead). Haven’t yet seen any of JJEFs containers but we are slowly looking out different series to try. Maybe this summer we will get North of Bracknell/Maidenhead. At the moment, too many to choose from! 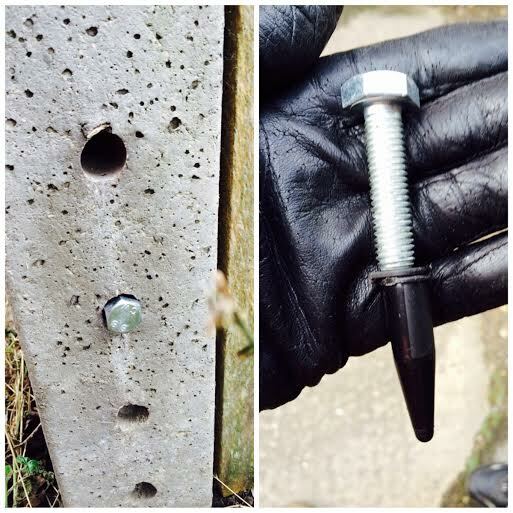 Been Geocaching yet? Give it a go…. Here’s a good start here in Hart.